Last year, a team of scientists spotted what they believed was a hybrid animal off the coast of Kauai, Hawaii. A new report from Cascadia Research Collective confirms they did -- and the new sea creature is the result of two distinct dolphin species mating. What the researchers discovered was a hybrid of a melon-headed dolphin (also known as the melon-headed whale) and a rough-toothed dolphin. In an interview with local newspaper The Garden Island, the head of the project said the discovery is their "most unusual finding." "We had the photos and suspected it was a hybrid from morphological characteristics intermediate between species," Robin Baird said. During their two-week project, scientists were able to get a biopsy sample from the creature and study its genetics. They were able to confirm that the animal was a hybrid. "Based on the genetics, the father was a rough-toothed dolphin and the mother a melon-headed whale," Baird told CBS News via email. One of the species that makes up this hybrid is very rare in Hawaii. Melon-headed dolphins usually don't swim in these waters, so when scientists spotted one, they put satellite tags on the animal. During this two-week study, scientists also spotted another rare species in the water, pantropical spotted dolphins, which they also tagged. Baird's research team is going to be back in Kauai's waters next month, when they hope to get more photos of the new hybrid dolphin and water samples. They also hope to do testing on other species in the area. 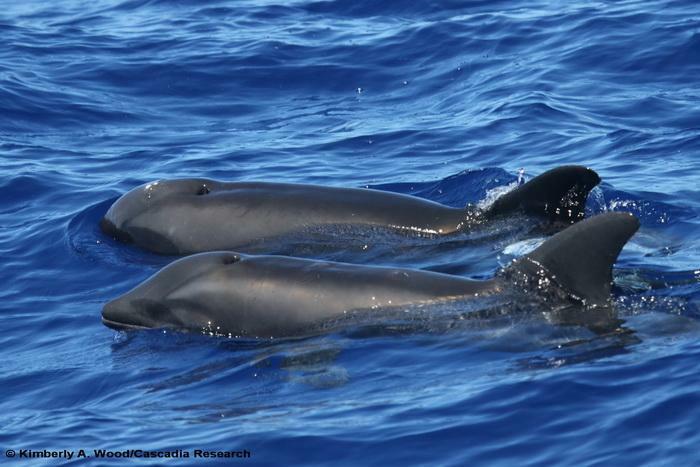 "We're hoping that just by talking to some tour operators and fishermen ... we might get tips and encounter something like pilot whales," Baird said. Editor's note: This article previously referred to the discovery as a "whale-dolphin hybrid," which is somewhat redundant. The melon-headed whale is not only a member of the Delphinidae family, making it a dolphin, but that family is a part of the infraorder Cetacea, making it a whale as well.